Tried that test AAF. Digital Performer 9.01 (Latest) opens a blank sequence. Nothing is imported. See screenshot. mrlimbic, I have emailed you with FTP details so you can download it too. You can post an FTP link. Browsers will understand it. I would like some test files too. Have sent to the s########@m##### address. I don't see an email - could you please resend? Also, if by m########a@gm#l.com you mean an email address that starts with m, that's not right. I get notifications about these replies at the correct address. I sent a mail to your m########a@gm#l.com address, Wednesday last week. Can you please check that mail account. I'm a little confused by your reply - it says you have supplied me with ftp download details (which I don't see) and also says it's not possible. Please clarify and/or send files for me to try. Thank you! Unfortunately we are not able to allow download of a sample AAF from the forum, as such if you need this then please advise and we will make available to you individually. I have supplied you with ftp download details, please advise if we can help further. Apologies for the delay will upload a sample, but will need to change the site configuration first to allow large file attachments. Last Edit: 3 years 3 months ago by James Carrick. I'd like to test a sample file to use in LogicX, but the files I see in this thread have expired. Could you please post new files to try? Thank you very much. Hi mrlimbic and Ryan, can you post the version numbers of the applications you have tried to import the AAF into so that I can work with the manufacturers to improve interoperability? I have nothing to do with motu. I just use DP sometimes. Also, I wouldn't rely on considering protools as implementing OMF and AAF in a 'standard' way if that is what you are using as your guide. In many audio applications that allow exporting OMF/AAF there is often a 'make compatible with protools' dialog and similar tick boxes for quirks in other DAWs. Often companies with the 'lock-in' mentality like protools purposely interpret standards in a weird way whenever there is the opportunity to do so. It forces other companies to accidently lock-in to them. 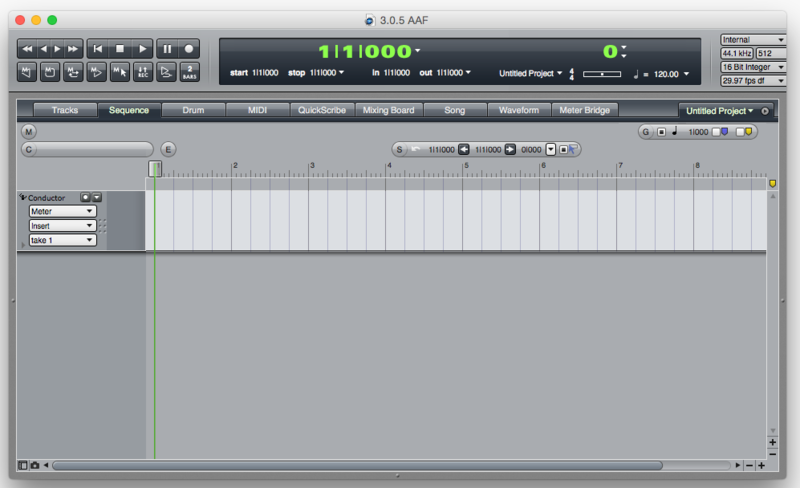 I bet you can find a way of intepreting the AAF standard that protools will hate. When you do find a solution for other apps, I think you may need to add a 'make compatible with protools' option. I have asked Motu for help with Digital Performer. We can't do much more than that as the AAF is standard. If they need things laid out a little differently - we'll need them to let us know about that. If you have any contacts with Motu, it would help if you could contact them and explain your need.